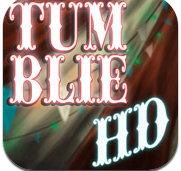 Tumblie HD is a spin off of I’m Destroyer, Tiki Totems, and all the other Jenga style touch-drop-land puzzle games where the goal is to bring an object safely to a platform without using too many touches or letting the beloved object fall off the edge into nothingness. 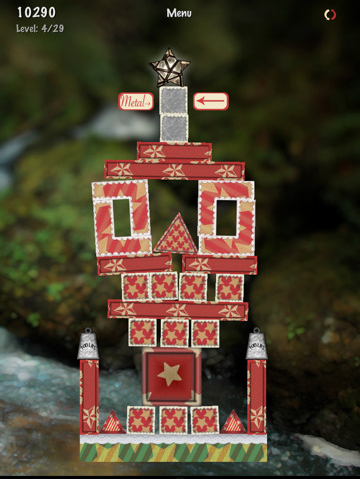 The result is a simple and addictive puzzle game based on the basic principles of physics. Move the right pieces of wood, blocks, and red dots one by one to get rid of them and watch everything tumble down until two points of your metal-like star descend onto the platform so you can move to the next level. Conceptually it’s quite easy, but the actual execution is a little bit harder. 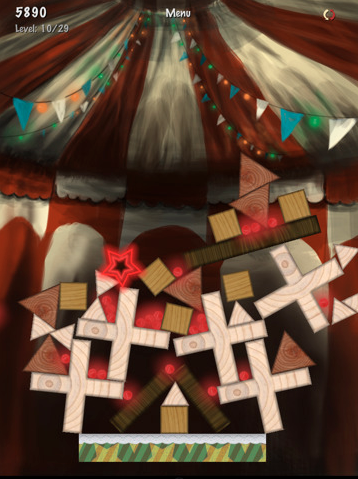 Tumblie HD has a carnival themed game menu with mediocre graphics, but in a way the amateurish design helps you remember that you’re actually buying this game from a person who developed this independently on their own time. Plus, once you’re playing it’s all about moving the right pieces and the actual block quivers and object falling is as good as any other competitor in this category of puzzle games. The music doesn’t really bring points to or against Tumblie HD, but the tumbling sounds of wood on wood are accurate, warm and welcoming, perhaps because they resemble the sound of a kid playing with retro wood blocks. In fact, that’s the way the entire game feels. Simple, approachable, and fun. One the whole, Tumble HD features ten levels with the opportunity to unlock extra content with measured success. Because there’s a resume button that allows you to retry failed puzzles, enough time can lead to eventual partial victory, but you haven’t truly won the game until you have figured out how to beat the levels without wasting any block removals as your star descends onto the stage. Either way, you’re bound to spend some real time with this game.